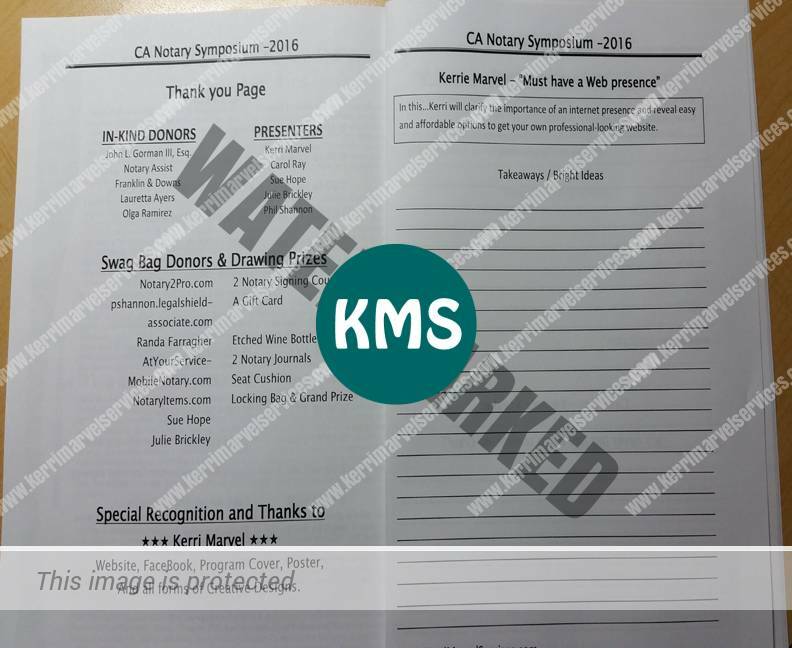 Last Saturday I was one of a handful of paid speakers at the Central California Notary Symposium (www.NotarySymposium.com). Most of us speaking are Notaries Public, and the group we spoke to were Notaries Public. The Notaries in attendance came from every level of experience, but all attended to learn how to Get Further, Faster (the Notary Symposium’s tag line). My topic was ‘Easy and Affordable Options for Your Professional Website’. Other topics included Putting Technology to Work, Streamline Your Loan Doc Signings, When to Use Witnesses, LegalShield protection, and a heartfelt story from our keynote speaker about how It’s Never Too Late to Start Something Great. We also had one of the founders from the software company NotaryAssist on hand to tell the group how it worked, and to offer a discount to get started. As a notary, I’ll be trying the software out on its trial offer! I was touched, and it was very sweet of the organizers Laura Biewer and Bobbi Scherrer, to give me a beautiful orange rose, and an etched magnum bottle of Cabernet as thank you gifts (all the speakers received the wine). I contributed to the project as well, by designing and creating the website, designing and creating the facebook business page, designing the initial flyer, program cover, and poster, and setup at BrownPaperTickets. Again, it was nice to be noticed, they thanked me in my very own section inside the program handout. The date selected to hold this Symposium was November 5, the closest Saturday to National Notary Public Day, which is annually, on November 7. This special day was created in 1975 to recognize notaries for their public service, and their contributions to national and international commerce. November 7 was chosen as National Notary Public Day because the first American notary public was appointed on November 7, 1639 by the Colony of New Haven. That’s going back a few years! er, centuries!